Gandalf is a true veteran of new age music with a career that spans 30 years and 32 albums so he definitely has something to say to us through his music as he has honed his art to a fine point with the release of each new album. 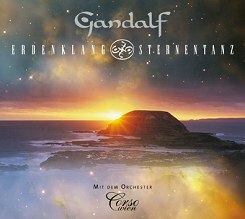 In May 2011 Gandalf released his latest effort called Earthsong and Stardance which he recorded with the Corso Wien Orchestra. As you might suspect from the title this album has a sweeping scope that covers not only the earth but reaches out to capture the universe itself in the music that he chose to include on this album. The Corso Wien Orchestra and the Sansrkit Choir helps the album to reach these lofty heights that Gandalf has set as goals for the compositions that are a part of this offering. The music is broken up into five main movements with the overall themes of The Unfolding of Worlds, About the Miracle of Life, About the Beauty of Being, The Paths of Man and The Great Ceremony. Each movement has several individual parts that capture the flow and the emotions that Gandalf wishes to convey to his listener. All the music was composed, orchestrated and produced by Gandalf so there is no doubt as to who is in control of the music that found its way onto this album. The orchestra, the choir and the solos played by Gandalf on this project are top notch and show forth the care that was given the arrangements by Gandalf when he orchestrated and produced the flow of this album. One word of caution as you listen to the five major movements on this release. The individual parts of the movements are mixed so as to be a continuous mix so that part 1 continues into part 2 and into part 3 without a break. For that reason if you are listening to MP3 files you might want to make sure that you have chosen all of the parts under each major movement so that the song does not abruptly stop in the middle of the piece. The overall feeling of the album is one of awe and reverence which you can feel in the way that the orchestra pieces were arranged. The album exudes a peacefulness and tranquility as it explores the stars above us and then comes back down to wander the beauty that we find in our existence right here on earth. 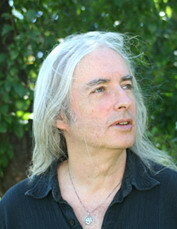 Gandalf has created emotional music with this release that is both introspective in that it asks the listener to look within themselves to find that which connects each one of us to the stars and the earth while at the same time asking that we look beyond ourselves at the majesty of nature and the universe that surrounds us. To see ourselves as part of the whole of the universe while still being individual in nature is something that Gandalf manages to capture in his compositions quite well. Gandalf has skillfully woven the solo performances into the compositions much like an orchestral solo occasionally punctuates a point in the flow of classical music where emphasis is needed to drive home the point of the music. I enjoyed the electric guitar that he chose to emphasize his point on The Unfolding of Worlds part 2 and The Paths of Man part 3 as it celebrates what had been reflective music up to that point. Gandalf uses the Sanskrit Choir in much the same way throughout the album by choosing very carefully when they will appear during each song so that the album never takes on the feel of an album of nothing but chants. His acoustic guitar playing has a tenderness to it that pulls you into the music as it offers a meditative moment to that which has come just before. With the orchestra cradling the acoustic guitar in its arms it makes the guitar that much more alluring. All in all Earthsong and Stardance delivers on its promise to take us on a journey of celebration and exploration of this universe that we live in and the planet that we occupy. Gandalf has always had an abiding love of nature in his personal life and that kind of devotion is sure to come out in the music that he composes. The album is a wonderful mixture of music that has a definite classical feel to it but with new age sensitivity that will appeal to all of Gandalf's fans who have followed his career these last 30 years. The music is thoughtful and will resonate with the listener if they give it a chance to move beyond the mind and into the heart. Gandalf once again shows that he understands both himself and nature with this release and shares his heart with those who are willing to look beneath the surface of these compositions. Recommended by Ambient Visions.